You're having trouble probably because installing the two versions at same time. Probably you whould need to manually fix database or install that other version and stay with that or properly remove it if you prefer this one. Oh! Another detail: is it standard or custom theme? That's still the other extension (or at least some parts). You have blind assistance enabled on browser. As you can see, that text is only for speech systems. The 1st option coul explain it, as old extension used images. I thing other two options should have effect on other icons also, so they are less probabke. I'm sorry, I don't quite understand what you mean with this post. What is this code and what can I do with it? 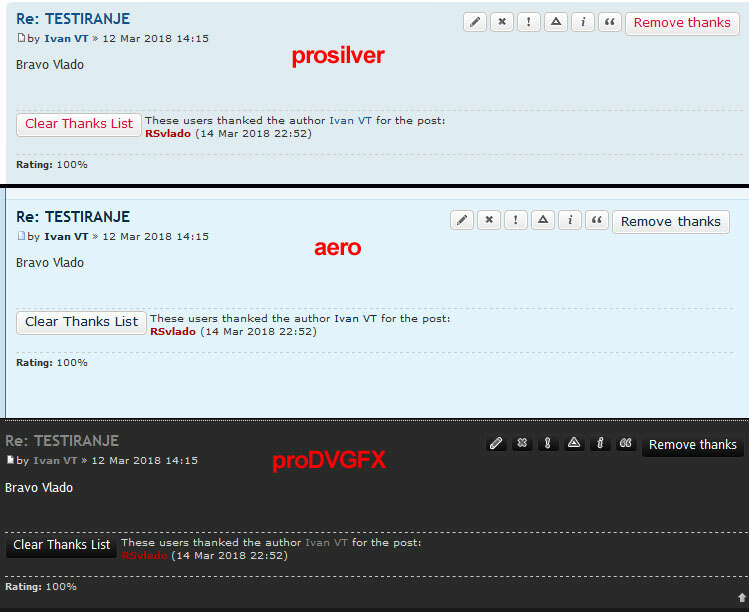 That code is Remove thanks button, taken directly from my forum. As text in the button is enclosed with a 'class="sr-only"', it means that it should be only for SR --> Screen Reader --> Aid for blind people. And never should be visible on your forum, at least if you don't have enabled any kind of visual aid. Also, I think that it shouldn't be red,a s it has no special class or style for that. So, I think that you have any kind of mix of both versions. You said you're using any kind of XAMPP. I suppose you work in Windows, that messes with capitalization and can be the reason of the trouble when managing both versions of this extension. That would clean any mix of both versions and should work OK. Thanks a lot, Naguissa By PM you reminded me where I made the mistake. I overwrote old (3.1.9) prosilver folder over new one (3.2.2). Why? Don't ask me why Now everything works OK.
Other thing, I'm festín new mobiquo folder version, it will be available today, I'll post it here then. Thaks to all that told me about new Tapatalk version available! personally.... i really would like to not show that in the mini-profile at all but i cannot find a setting to not display that. but since it is displayed, i would like to see why the counter is not counting? 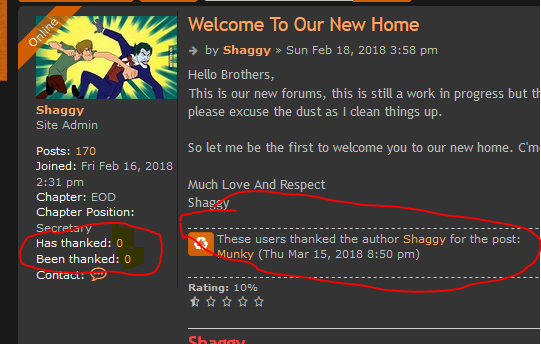 I've checked on my own forum to see if something was wrong but it's prefect, this issue is not shown. Could you provide a link to the forum? The permission role "ROLE_USER_NOAVATAR" unexpectedly does not exist. It seems to be something related to ROLES in your phpbb installation. I've not been told about anything similar, and even the code, as far as I remember, doesn't use any role like this. It should be when defining defaults for all roles (from DB, not manually), and that role is damaged in your installation. Solved via PM simply deleting miniprofile extra fields, as was board owner's desire.